Since solid block ice is your most basic raw material, every serious Shaved Ice vendor will want their own Sno-Block™ machine sooner or later! Why not sooner? With five different models to choose from there's one that's perfect for any size operation and budget. Click below on the one that's right for your operation to see its photo and specific features. Block size - 5 ½" x 5 ½" wide, up to 15" long. 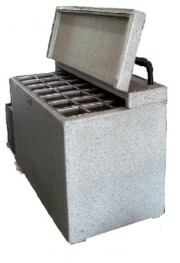 Block weight - 12 ½ to 15 Lbs, depending on length of block. Click on one of the links below to choose a model by how many blocks of ice you think you'll use per day. The trick here is to produce the optimal sized blocks of ice at a high rate of speed. So how does Sno-Block machines produce perfect blocks of ice so fast? Simply put, liquid heat transfer. Because liquids transfer heat much more efficiently than air, all Sno-Block machines utilize a solution of Propylene Glycol and water to transfer heat out of the water in its block forms to produce solid block ice at a high rate of speed. In other words, the heat transfer solution described above can be considered a "food grade anti-freeze". A Sno-Block machine's "ice forms" (a.k.a. 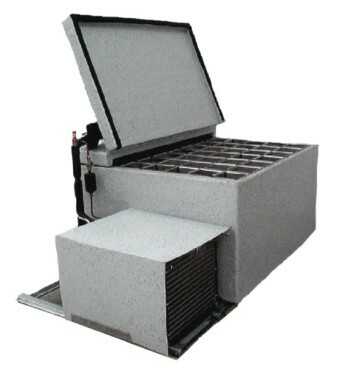 block ice form cans) hold plain water and sit partially submerged in this solution on racks fixed to the top of the machine's cabinet. After the freezing cycle is complete you then "harvest" the block ice from the can forms, bag the blocks and store them in a conventional air cooled storage freezer for later use. Produces solid block ice perfectly sized to fit the FlavorSnow Shaver™. Fast Freezing: 8 or 12 hour "multi block" batch cycles. Eliminates your dependency on ice suppliers. Cut Costs: Make ice for the cost of electricity and water - around a penny a pound. 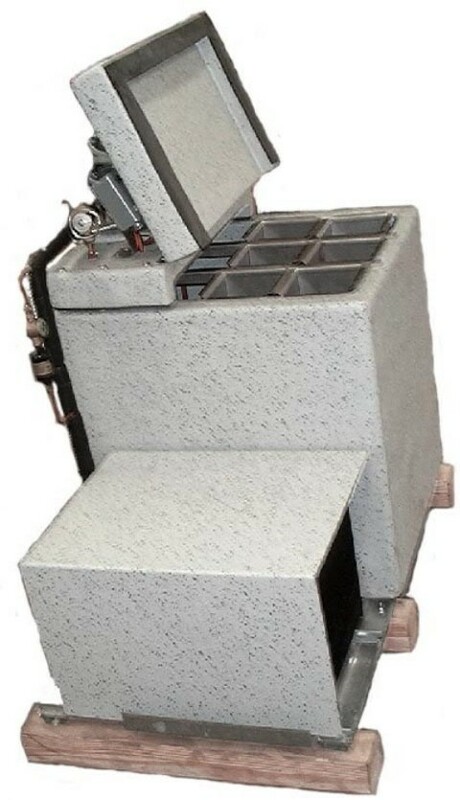 Sno-Block machines are the only block ice makers constructed of durable Gel-Coated Fiberglass - the same material used to make boats for the harsh marine environment. This makes the cabinet, in the event of damage, easily repaired without leaks. Using this material makes for much better insulation against the input of heat. The machines have a top mounted "visual" T-Stat for better temperature control and uses Ozone friendly refrigerant. Each machine has an Electrical Whip, Door Gasket installed and is run-tested before shipping. Each machine (except the 1500 model) is shipped ready to plug in and go, along with required amount of Propylene Glycol solution. High quality, food grade Heavy Duty Plastic or Stainless Steel block ice form cans are available. Our most popular size, the Sno-Block 220 will produce up to 18 ice blocks per day (9 per 12 hour cycle) in the exact size necessary to fit a FlavorSnow Shaver! This is the perfect machine for the “Mom & Pop” operation. The 404-220-SB makes 9 Blocks of ice twice a day, totaling 216 lbs. of ice. NOTE: This is the smallest Sno-Block brand machine made and, as an optional feature, the refrigeration unit can be top mounted to save even more valuable space in your stand. It’s dimensions are 37" high x 40 3/8" long x 26" wide so as you can see, if space is a factor, this is the machine for you. Shipping weight is 330 Lbs. The model we recommend most is the Sno-Block 440. Producing up to 40 ice blocks per day (20 per 12 hour cycle), the 440 will supply most moderate volume operations with all the ice they'll ever need! 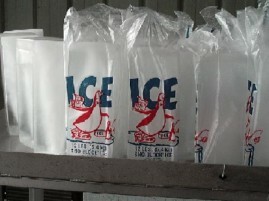 That's 480 lbs of Ice per day produced for less than .25¢ per block - including .10¢ for the bag! Dimensions are 37" high x 70 ½" long x 26" wide. The machine weighs 400 lbs. It is shipped ready to plug in with 30 gallons of Propylene Glycol solution making the shipping weight 700 lbs. Now we're getting to the "BIG" machines! The Sno-Block 1000 will produce up to 80 blocks of ice per day (40 per 12 hour cycle). That's enough for the busiest Shaved Ice outlet! Some smart vendors will even "upgrade" from a 440 to an 1000 which enables them to supply fishermen, campers and other Shaved Ice vendors in their area. It's also a great machine for the special event vendors. You can stock pile all the ice you'll need in advance for those high volume "weekend" events such as county fairs and festivals. The 1000's dimensions are 37" high x 70 ½" long x 40½" wide and weighs 510 lbs. It is shipped ready to plug in with 40 gallons of Propylene Glycol solution making the shipping weight 910 lbs. With a larger, heavy duty compressor and the same "footprint" and cabinet size as the 1000 above, the Sno-Block 1200 will produce a guaranteed 80 blocks per day even in adverse conditions. If you plan to attend high volume sales events, re-sell ice blocks to your competition or have multiple moderate sales volume locations of your own to supply, this may be the Sno-Block that's right for you! With the same cabinet size as the 1000 and 1200 but with two, that's right, two (2) heavy duty 2-1/2 Hp compressors, the Sno-Block 1500 produces a whopping 120 ice blocks per day (40 per 8 hour cycle). Regardless of whether you use your own ice, sell it to others, or both, the 1500 is the "Mac Daddy" of all Sno-Block machines and up for the job. The 1500 model Sno-Block is perfect for those larger operations that need a dependable and consistent source of beverage quality, solid block ice in super large quantities! Sno-Block™ is a Trademark of Delta Ice, Air & Heat, Inc.